Praying for European politics as you engage with other Christians with your same beliefs, interests and calling. 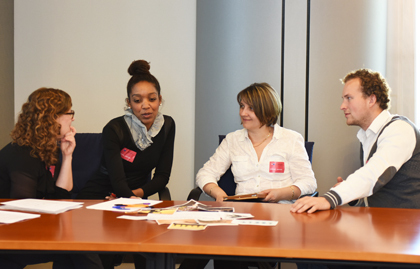 This was the aim of the first Youth European Breakfast last Thursday in the European Parliament. 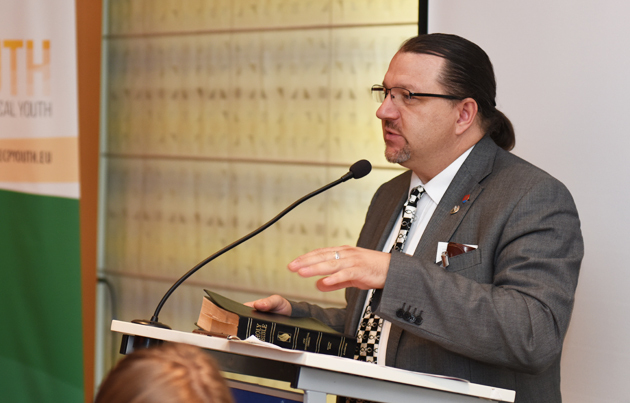 The event was hosted by the Slovakian Member of the European Parliament Branislav Škripek and was organized by the European Christian Political Youth (ECPY), Forum Brussels International, the European Evangelical Alliance (EEA) and the International Fellowship of Evangelical Students (IFES). “Praying together in the name of Christ revives our faith. This is particularly important when facing everyday secularist and atheist agenda”, explains Denys Dhiver, president of ECPY. Around fifty students and young professionals attended the event. During the breakfast several speakers discussed current topics such as the refugee crisis, climate change or freedom of religion. The young attendees were encouraged to live their faith in their jobs. Dr. Iain Benson, philosopher and professor of law, spoke about the emptiness and overuse of the term “values” today. “Values’ language is an obscuring language for morality” he said, and added that Christians should live out virtues like faith, hope and charity. “For Christians, it is not possible to leave our faith at the door when going into politics, otherwise we would be like empty shells”, says Mr. Dhiver, president of ECPY. Mr. Škripek was clear in this point: “We do not proclaim the gospel enough. Let’s be brave. You have to be the voice, the people who cannot hide their faith”. Mr. Benson deeply criticized secularist approaches: “The secular does not exist! We have a public sphere with different beliefs, both religious and non-religious. There is no sphere of unbelief.” For his part, Mr. Škripek insisted on freedom of religion or belief as an example of mutual respect for and between people. “It gives dignity no matter what men believe”. 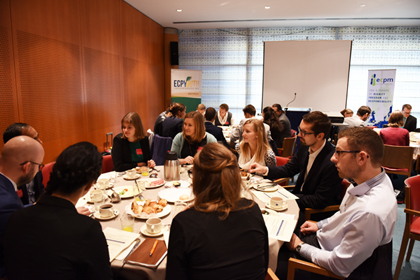 During the breakfast time, students and young professionals were asked to discuss in small groups what would be the good response as believers in Christ when facing Europe’s situation and challenges, especially with the current refugee crisis. There was a short time for prayers. Time for discussions in of the side events. Although there is already a big annual prayer breakfast at the beginning of December, this was the first youth event and it is also meant to happen annually from now on.